A gorgeous, relentlessly entertaining open-world piracy simulator packed with interesting 18th century rogues. Assassin's Creed 4: Black Flag doesn't really want to be an Assassin's Creed game, and I don't blame it. It seems keen to shrug off the oblique, convoluted lore surrounding the eon-long Assassins vs Templar power struggle, which managed to reach new peaks of ludicrousness even after that bit in the second game when you punch the Pope into unconsciousness in order to access an alien hologram. Black Flag stuffs all that into a box labelled 'whoops', throws it down a deep, dark hole and sends you on third-person free-running murder missions on the high seas instead. By Blackbeard's bushy eyebrows, that is a welcome move. You are Edward Kenway, a rogue who loves money enough to leave his girlfriend in port and sail to the West Indies in search of a vast fortune. In the opening scenes he steals an Assassin's hooded garb and wristblades and accidentally falls in with a crowd of Templars, a team of comedy evil caricatures led by a bearded grand master and backed up by a plate armoured man-ogre who throws axes at people. They're searching for the Observatory, an ancient device that enables its user to see the location of anyone in the world at any time. The Templars want it because it'll make coups easier, the Assassins want it to stop the Templars, and Kenway wants it because it's probably the most valuable thing on the planet. If that sounds a bit removed from piracy and plunder, don't worry. After the two-hour hand-holding tutorial section – mercifully shorter than in previous Assassin's Creed games – the Observatory is relegated to distant long-term objective status, and the story refocuses on the building of the pirate paradise of Nassau: a lawless little utopia maintained by a collection of criminals seeking respite from the attention of the law. That means Kenway isn't exactly an Assassin. He has all the free-running, jumping and killing skills of the sect – a genetic bonus, it's implied – but his relationship with the series' morally ambiguous order of murder monks is fractious. That keeps the plot's severest absurdities at arm's length and lets you just be a pirate and do pirate things. Hang out with famous brigands like James Kidd. Watch affable rogue Edward Teach become an unhinged, scenery-chewing Blackbeard. Sail across the ocean, rob ships, fight the British, take sea forts for yourself, harpoon whales, explore large coastal cities such as Havana and raid ancient Aztec ruins for treasure. All this in a beautiful tropical open world that's at its glowing, hyper-detailed best on PC. On land, much is familiar. Hubs such as Havana and Nassau are large, but there are no urban spaces to match the size and spectacle of Rome or Constantinople. A shame, certainly, but there's still a huge amount to explore in scattered settlements across Black Flag's massive archipelago. You'll sail between stilted pier towns tucked away in rocky alcoves, tropical islands sprinkled with treasure chests and larger townships like the manicured, orderly haven of Kingston. As always, you have to climb to high perches to scout sections of town, revealing chests, stores and sidequests in the area, the latter including a welcome increase in open-world assassination missions and warehouse raids. These place targets in open areas patrolled by British or Spanish forces and invite you to solve the problem creatively. Such missions feel closer to the original vision for Assassin's Creed than the scripted story segments which, while much improved over Assassin's Creed III's restrictive and buggy offerings, are still rather over-reliant on lengthy follow tasks. To raid a warehouse, you must first scan the area for the key holder, pickpocket it off him (or rob his corpse) and then make your way to the door without being shot dead by elevated musket snipers and roaming guards. Stealth has been tightened up to make this more interesting. Pervasive jungle foliage offers constant cover and targets can be marked using Kenway's magic 'Eagle Vision' mode, which lets you track guards through walls – a serious advantage, yes, but you no longer have access to the silent, ranged instant-kill throwing knives that made similar challenges trivial in previous games. Instead you have the blowpipe, which can temporarily knock enemies out, or send them into a berserk rage. The snipers are a pain, perched on high guard towers that overlook most restricted areas. They have long-range muskets that can drop you to half-health in a single shot. The blowpipe is an obvious counter, though the short duration of its sleeping effect inspired several comical races to kick its victims back into unconsciousness before they awoke. You can also hug a nearby enemy to use them as meat shield moments before a sniper pulls the trigger – another trick carried over from Assassin's Creed III. With the addition of explosive barrels that can attract multiple enemies, and outhouses as hiding places, there's some room to get creative with your approach to these open challenges. I particularly enjoyed turning guards against one another. I used guns dropped by friendly-fire victims to pick off the snipers that killed them, shoved brutes into their own tossed grenades and then scooped up their abandoned axes to butcher crowds of lesser enemies. Your foes aren't smart, but they're fun to massacre. You'll want to take advantage of the environment in this way a little more than in other Assassin's Creeds, as Kenway's kit has been slimmed down from previous instalments. You can pick dropped weapons from the ground and wield them expertly, but you can't carry knives or broadswords around, sadly, which put an end to my favoured assassination technique of lobbing claymores at enemies across rooftops. Instead, Edward's hidden blades, a pair of sabres and a brace of pistols are his go-to close combat problem solvers. Your one shot mini-muskets can be fired rapidly mid-combo to loudly thin out surrounding enemies, the rest are easily put down with brutal instant-death counter moves. More skilled enemies and brutes – easy to spot thanks to their size and their tendency to casually roll grenades into a fight – must first be distracted with a block-breaking move before being infinitely stabbed. Very large numbers present a challenge, but combat is mostly there to make you feel deadly. I'd like to see more tough fights with more precise strikes, and to get rid of the pointless disarm move, but fighting remains an effective and violent power trip. There's plenty to do on Black Flag's many islands, but you'll spend half your time on the waves, on your ship, the Jackdaw. The archipelago map operates in a similar way to the smaller city ones, in that you're unable to see all of the available activities in an area until you've conquered a region's fort. Once that's done you'll be able to identify whaling spots, British and Spanish convoys and sunken shipwrecks. You can use a diving bell to travel underwater to investigate these watery remains, dodging sharks to reach the treasure within. Sailing is lifted almost wholesale from Assassin's Creed III, with some additional concessions to accessibility. By which I mean your boat handles like a bus. Wind direction has little meaning. You can stop without dropping anchor and can magically taxi sideways into ports when docking. I say this to pop any assumptions you might have about Black Flag as an authentic sailing sim, not to suggest that it isn't good fun. Furthering the boat-bus analogy, you shift up and down through four gear settings to determine your speed. At slower speeds your ship can take tighter turns, at its highest the camera pulls out to offer a majestic view of your vessel carving through the waves. Most of the UI fades so you can see more of the ocean, and your crew start singing echoing sea shanties. You'll see no bloody gums or men overboard here. This is a romantic vision of piracy in the early 18th century, and no less absorbing for it. In Assassin's Creed III, sailing was an experimental section, quite separate from the rest of the game. 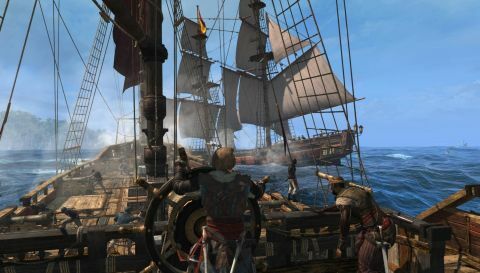 Black Flag meshes naval exploration with Assassin's Creed's traditional free-running and combat systems to excellent effect, particularly when hijacking ships and taking forts. To take a ship you have to first reduce it to a flaming wreck using your cannon, mortar, fire-barrels and various forms of shot. Your weapons are selected contextually based on the direction you're aiming. Point the camera out of the sides of your ship, and you'll deal damage with your broadside cannon using narrowing trajectory indicators that let you arc shots over the waves. Aim past the bow and you'll fire chain shot that tears up the enemy's sails and slows their movement. Aim rearward and you'll find yourself throwing fire-barrels overboard, which serve as floating mines. If you pulverise a vessel without sinking it, you can draw alongside and board by ordering your men to use grapple lines to pull both ships into a single battleground. Then you're free to charge the enemy deck by leaping between their interlocking masts, or with an audacious Errol Flynn rope swing. It's an impressive technical feat, and one of the most exciting things I've done in a game this year. Considering the feature bloat of their recent games, it's a relief to see Ubisoft successfully bringing formerly disparate systems into coherent events like this. From Far Cry 3's plant collection and animal skinning to the pointless homestead-improving minigames of Assassin's Creed III, successive sequels have shipped with additional irrelevant systems while the existing ones have gone unrefined. In Black Flag such systems, like the economics model that lets you improve the Jackdaw, are far more worthwhile. In the latter, you improve your weapons and armour using the materials and money you earn pirating. That lets you take on larger ships, which present different challenges at the naval and close combat level. Bigger ships come with advanced weaponry, and carry captains, crow's nest snipers and other tough enemies on board. As you commit more acts of piracy, your wanted level increases and you'll be pursued by hunter ships, notable for their ominous red sails. At the highest level, you can take on huge 'legendary ships' hidden around the map. It's a good economics system, designed to gate a series of escalating challenges, not to provide unnecessary padding. Black Flag will try to waste your time a little bit, however. The ship upgrade system is good, but the sidequest that lets you send captured boats on missions around the world for monetary rewards is rubbish, supported by a painfully weak turn-based ship combat minigame. The near-future sections make an unwelcome return, and are more pointless than ever. The gormless Desmond Miles is gone. Now, in first-person, you wander around the smug offices of evil corporation Abstergo, as an employee charged with digging through Desmond's genetic memories for fun pirate moments to go in their latest entertainment product, an entertainment product, it's implied, that you are playing right now. It isn't half as clever as it thinks it is, but these bits only take up about five minutes every few hours of main-mission progression. Far Cry 3's crafting system has also been air-dropped in, which means you're obliged to hunt animals in order to skin them and use their bones to upgrade your gear, or add extra pistols to your body-holster. That busywork is easily sidestepped in favour of the dozens of available alternative tasks. Much the same can be said of multiplayer, which returns in familiar form. As in previous editions, you can take part in up-to-eight player sessions that cast players in predator and prey roles. In predator mode you have to hunt players as they attempt to disguise themselves and hide in small city-block arenas, scoring extra points for exotic kills. As prey, you take up a hidden position and hope for the best. It's still an interesting idea for a multiplayer mode, but there aren't enough ways to bluff and counter-bluff opponents to keep it interesting for more than an hour or so, and more traditional modes such as control-point capture are too chaotic to sustain competition. There's a cooperative 'Wolfpack' mode as well, in which up to four players charge around killing labelled foes to add seconds to a rapidly expiring timer. The rush to murder enemies before your allies removes any coordination or finesse you might want to bring to each objective, which means you're not assassins, you're just a stabby mob. Multiplayer is a novel diversion for a few hours, but there's plenty more entertaining action to be getting on with in the singleplayer portion. When the tutorial section is done, the game sets you free on the ocean and places a distant objective marker on the western edge of the map. It took me four hours to reach that marker. I was drawn into a dynamic naval battle between British and Spanish forces. I navigated a storm and looted trade ships wrecked by its water twisters. I harpooned a bull shark. I docked in a curious little cove and got into a fistfight in a bar. Forget the Assassins, the Templars and their nonsense war. Loot, pillage and steal instead. The rewards are so much greater.